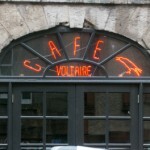 As many of you will know Avalanche launched at Cafe Voltaire to coincide with their new opening hours and menu. However as some of you have commented there seems to have been a distinct lack of food ! Fear not the plans for food have not changed but have been delayed due to the classic “circumstances beyond our control”, Cafe Vol with have its own kitchen but therein lies the delay. Consequently until everything is up and running the Cafe Vol staff will look after the shop leaving me free to deal with other stuff including the new Platform 2 market at Waverley station. You will still be able to pick up the new Broken Records CD, look through our promo posters and browse through the vinyl of course. Depending on the timing we will reassess when the full menu is available. There would have been a rejig for the Festival anyway so it may be that that will coincide. I will of course keep customers informed as to what is available and orders will be able to be collected too. My thanks to the Cafe Vol staff and management for being so accommodating.